If I step back in my mind’s eye and look at what we’re doing, it doesn’t make any sense. Then again, flipping through scripture reveals that being used by God often takes on a form that makes no sense to men. Ezekiel lays on his side for for over a year and eats food cooked over dung, Jesus smears mud on a man’s face, and if I went on, the list of strange behavior in the bible would take too much space for this format. 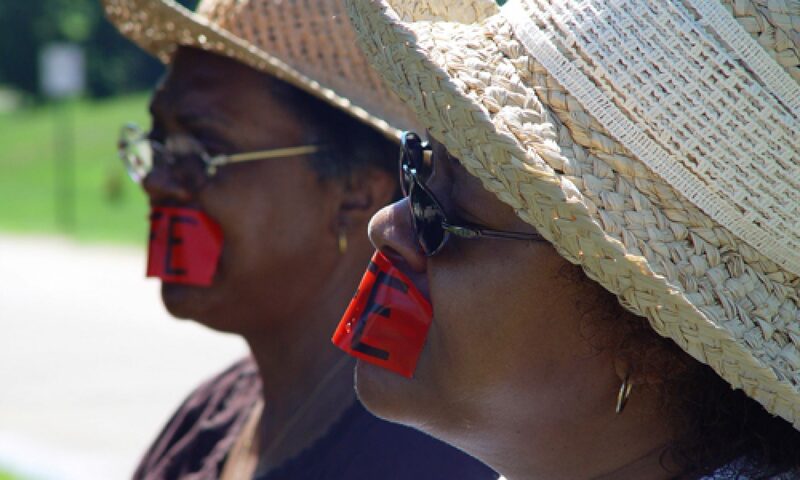 We’ve been standing with “LIFE” written on red tape and placed on our mouths since May of 2013 in front of a courthouse. The strategy laid out by heaven may draw the consternation of men, but I care not. I am resolved to employ the plan of God and ride with Him to victory. “For What” you may ask, “are we seeking victory? And why a courthouse?”. In May of 2013, Arkansas and North Dakota passed laws restricting abortion at 12 and 6 weeks respectively. These are the most restrictive laws on abortion in our nation and a direct frontal attack to Roe v Wade. The ban in North Dakota would put a stop to 90% of the abortions in that state. As always in these situations, the legal battles over these laws commenced. These are likely the most significant cases on abortion in the 42 years since Roe v Wade, and we knew that St. Louis would once again be integral in determining if an entire people group will be recognized as human. The Eight Circuit Court in St. Louis sits one step below the supreme court and our court system was the starting point of the Dredd Scott case which made it’s way to the US Supreme Court. This case tragically decided that black people were less than human. Judge Harry Blackmun was promoted from the 8th Circuit to the US Supreme Court where he authored Roe v Wade, deciding that the pre-born are less than human. Our stand in prayer was labeled “The Gaddite Stand” after the warrior tribe of Gad who in Numbers 32 agreed to fight for the inheritance of the other tribes before receiving their own inheritance. We would war in prayer and prepare the ground for these cases to arrive in St. Louis on behalf of Arkansas and North Dakota, believing that our own inheritance of LIFE giving laws would be released in Missouri. A small band of prayer warriors stood regularly through wind, heat, soaking rain, snow, and pleasant sunny days. In August of 2014 several people were given words independently indicating that the ground of the courthouse on which we had been standing had been given to us, that the court belonged to us. With increased expectation of what God was doing we pressed in prayer, anticipating the arrival of the cases. In December 2014 we received word that the cases would finally be heard in St. Louis on the 13th of January, 2015. Praying that day, I could feel the satisfaction of the Lord, that we had been faithful with the Gaddite Stand. In conversation with some of the lawyers in the cases, it became apparent how important our prayers had been through the process. The attorney defending the Arkansas law relayed how he was the only pro-life attorney in the office under a pro-choice attorney general and had to prepare for this case alone. He told how miraculous it was that the attorney general even allowed the law to be challenged up to the 8th circuit court. We spent time in prayer during this season in early 2014 praying for that attorney general by name. Our assignment is not over. It has been a pleasure to partner with the Lord in prayer and see how our prayers were used to shape history, but these cases are not finished. The three judges (Benton, Shepherd, & Smith) are deliberating their decision now and we expect a decision to be released sometime in the next six months. We must continue to pray for them as they consider these cases. As strange as we may look at times when we follow the Lord’s direction, it is going to be worth it all!